Do you remember Jem? You probably don’t remember Jem but that’s ok because IDW is here to remind you of the totally outragious and batshit crazy cartoon. IDW the publisher of titles like My Little Pony, G.I. Joe and Edward Scissor hands comics is adding to their 80’s cartoon list with the announcement of a comic about Jem and I couldn’t be happier. Let me break down the plot of Jem for those of you who don’t remember anything beyond the fact that it happened. Jerrica Benton’s father dies leaving her a music company with a talking holograph machine and a house full of orphans but apparently not a fortune. 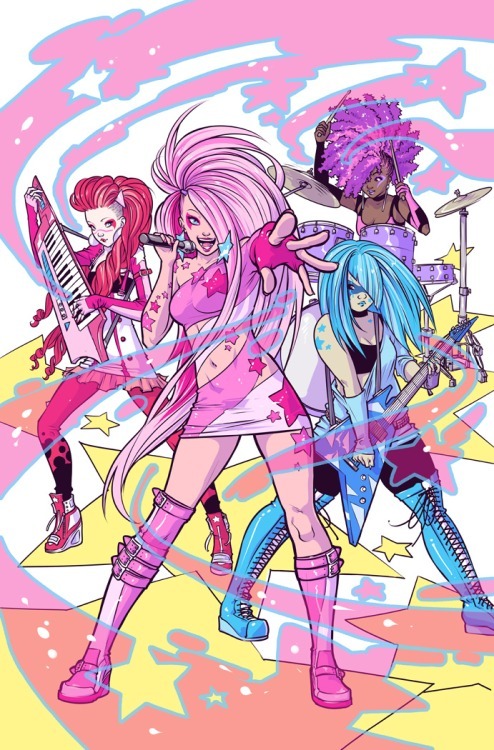 In order to make money to care for the orphans Jerrica uses the holograph machine to create the band called Jem and the Holograms with her multi-ethnic friends. The machine named Synergy projects the hologram of an 80’s glam band on Molly over the girls and something something music…look don’t think to hard about it. Mind you Jerrica is also like a teenager so why she has control over any of this is beyond me. What follows is basically battles of the band with their musical enemies The Misfits (shhh lets pretend they’re not a real band). Who are also decked out in 80’s crazy town fashion but you know more evil looking. My absolute favorite part of this series of events that makes no sense is Rio Pacheco Jerrica’s boyfriend who is cheating on her with Jem. The amazingly named Rio doesn’t know that Jerrica and Jem are the same person so we’re all just supposed to be cool with him cheating on his girlfriend…with his girlfriend. If Jerrica has a problem with him cheating on her she sure doesn’t mention it to the audiance. He also has unexplained anger issues because why not. I can not wait to see how IDW does with this pile of crazy they’ve purchased. Well it looks like I’m going to have to add Gravity Falls to my cartoon watching list as one of my absolute favorite human beings Neil Degrasse Tyson is making his cartoon debut as a Waddles the Pig in the show’s Halloween episode.